CHERRY HILL, NJ : October 31, 2008 - Subaru of America today revealed the Forester XTI Concept. It will be unveiled to the public at the 2008 Specialty Equipment Manufacturers Association (SEMA) Show, which runs at the Las Vegas Convention Center Nov. 4-7. The Forester XTI Concept combines the versatility of the all-new Forester 2.5XT with the all-out street performance of the rally-bred Impreza(R) WRX STI. All new for 2009, the Forester was named MOTOR TREND magazine's SUV of the Year. The magazine applauded the new Forester's combination of performance, utility, comfort, safety technology and value in giving it the award. MOTOR TREND editor Angus MacKenzie, citing the judges' unanimous decision, said, "The Subaru Forester is the SUV for our times." The new Forester XTI Concept is an SUV for 0-60 times, estimated to hit the mark in less than 5 seconds. Can a vehicle be both wicked and practical? The Subaru Forester XTI answers with a roomy interior and a lot of turbo boost. The Forester XTI ultra-performance CUV inherits the full STI treatment, with parts developed by Subaru Tecnica International (STI), the high-performance and motorsports subsidiary of Fuji Heavy Industries Ltd. The "Wicked" portion starts with the styling, which is set off by a custom Atmospheric "Re-Entry" paint scheme. The front lower spoiler and Sport Mesh Grille are from the Subaru Genuine Accessory catalog and are joined by a JDM body kit, including side skirts, a rear skirt and a gate spoiler. Designed and built by Subaru of America technicians, the crew installed the engine and entire drivetrain from the Impreza WRX STI. In the Forester XTI, a custom stainless steel cat-back exhaust system from the Subaru Performance Tuning (SPT) catalog helps to raise output of the 2.5-liter intercooled turbo engine to 315 hp (from 305 stock) and 300 lb.-ft. of torque (from 290 lb.-ft. stock). As in the WRX STI, power flows through a close-ratio 6-speed manual transmission and the Driver Controlled Center Differential (DCCD) version of Subaru Symmetrical All-Wheel Drive. The DCCD system offers three selectable automatic performance modes in addition to six manual center differential-locking settings. The 18 x 8-in. S204 forged alloy wheels are by STI and are wrapped in Yokohama Advan Neova 255/40R18 performance tires. The Forester XTI also features an adjustable coil-over suspension by STI. The powerful Brembo brakes come right from the stock WRX STI, with 4-piston front calipers, 2-piston rear calipers, Super Sport ABS and Electronic Brake-force Distribution (EBD). Inside, the Forester XTI features leather and Alcantara sport seats, a special instrument cluster, front dash and center console and leather-wrapped steering wheel. CHERRY HILL, NJ : October 30, 2008 - Subaru of America, Inc. today revealed the Mountain Rescue Forester® Vehicle, built for the National Ski Patrol (NSP). It will debut at the 2008 Specialty Equipment Manufacturers Association (SEMA) Show that runs at the Las Vegas Convention Center Nov. 4-7. Working with Subaru of America, Detroit-based Specialized Vehicles built the Mountain Rescue Forester Concept as the ultimate first responder vehicle, bolstering its trail-driving capability and equipping it with essential Ski Patrol rescue gear. Based on the 2009 MOTOR TREND SUV of the Year Subaru Forester 2.5XT turbo crossover utility vehicle, the Forester Mountain Rescue Vehicle is designed to help Ski Patrol crews conduct rescues in difficult terrain and weather conditions. The men and women of Ski Patrol risk their lives in the mountains, fighting avalanches, performing daring rescues and keeping unruly skiers and snowboarders from endangering others on the slopes. Subaru and skiing have gone together since 1974, when skiers first discovered the all-weather traction of Subaru models with 4-wheel drive. In stock form, the 2009 Forester 2.5XT combines Subaru Symmetrical All-Wheel Drive with 8.9 inches of ground clearance, more than other crossover SUVs, which are typically in the 6.5-7 in. range. The Forester Mountain Rescue Concept delivers more than 14 in. of ground clearance through an Air Lift custom adjustable ride height air suspension system. Added off-road and snow traction is provided by Yokohama Geolandar MTS 30 x 9.5-in. tires on special 15-in. Subaru custom-reversed near-zero offset steel wheels. For extra protection on the trails, the Forester Mountain Rescue Concept is equipped with custom front and rear skid plates by DeeZee and custom Trail Armor by Bushwacker, including fender flares, lower door cladding, a rear gate guard and tail light guards. Skiers won’t have trouble seeing the Forester Mountain Rescue Vehicle coming: an emergency light package, augmented by Subaru Genuine Accessory Baja Sport Activity Lights, ensures visibility from a distance and in all types of weather. To illuminate a rescue site, the vehicle is equipped with roof mounted Visi Light LED spotlights – five in front and two in the rear – by Hamsar Diversco. Topping off the concept vehicle’s distinctive styling, a DeeZee custom grille guard helps protect the Sport Mesh Grille from Subaru Genuine Accessories. Once on the rescue site, the Ski Patrol crew can use an Ultimate Performance 9.5i Thermometric 9,500-lb. winch by WARN. Remote rear door openers and external quick-access utility compartments play a vital role when time is of the essence. Extra wide round crossbars help secure the Subaru Yakima ski carriers, which on this vehicle hold Nordica snow skis. A rescue toboggan from Cascade rounds out the rescue equipment. Subaru is proud to be the official vehicle of the NSP, a nonprofit organization headquartered in Lakewood, Colorado and dedicated to serving the public and the ski industry by providing education on emergency care and safety. Subaru has been the Official Vehicle of the NSP for many years and for good reason – Symmetrical All-Wheel Drive, robust construction and durability make any Subaru ideally suited to tough winter conditions. HIROSHIMA : October 31, 2008 - Mazda Motor Corporation will display the Mazda MX-5 (known as the Mazda Roadster in Japan) at the “Japan Car” exhibitions to be held in London and Paris during November 2008. TOKYO : October 31, 2008 - TOYOTA MOTOR CORPORATION (TMC) announced today that it plans to export the "Sequoia" SUV made at Toyota Motor Manufacturing, Indiana, Inc. to the Middle East and South America, and the "Tundra" pickup truck made at Toyota Motor Manufacturing, Texas, Inc. to South America. 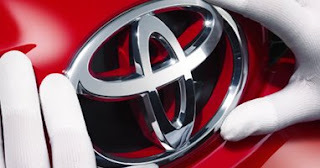 The planned exports, scheduled to start in December 2008 and to be conducted through Toyota Motor Sales, U.S.A, Inc., are part of an ongoing TMC effort to optimize global production and supply structures to allow TMC to better respond to changes in market demand; they also reflect increasing demand for full-size SUVs in the Middle East and South America and for full-size pickup trucks in South America. Annually, TMC will export to the Middle East approximately 15,000 units of the Sequoia, and to South America, approximately 150 units of the Sequoia and approximately 1,000 units of the Tundra. Holding a long-term view, TMC plans—by uniting research and development, procurement, production and sales functions to more-flexibly meet changes in demand—to establish a stable global supply system based on strengthened production and supply structures. 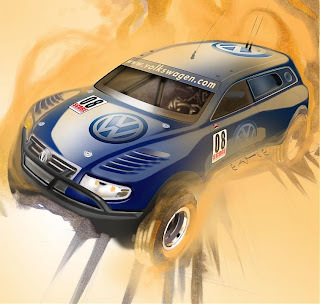 WOLFSBURG : October 30, 2008 – Volkswagen AG hasn’t raced in its first Baja 1000 yet, but it already is promising to do better the next time around. Motorsports Director Kris Nissen is realistic about the auto maker’s chances in its first go-around at the Baja 1000 race next month but vows 2009 will be a different story. VW will unveil its specially built Touareg TDI Baja racer at the Los Angeles auto show Nov. 19 before heading off for the Nov. 20-23 event, which starts and finishes in Ensenada, Mexico. The racecar is powered by the same 5.5L V-12 turbodiesel used in the Audi R10 Le Mans racecar. It generates 550 hp and 627 lb.-ft. (850 Nm) of torque in the 4,850 -lb. (2,200-kg) Touareg. “We don’t expect to win the first race,” Nissen says here at a media backgrounder on VW’s expansive racing program. “It’s a new vehicle, with rear-wheel drive; a heavier vehicle. Although it is outspent on racing by sister Audi AG, Nissen says he believes VW has built over the past four decades the auto industry’s most expansive racing program. In addition to this year’s entry in the Baja 1000, VW races in the Dakar Rally Series, 24-Hours of Nurburgring, the Formula 3 Euro Series and the Formula ADAC Masters. It also operates its own racing circuits, such as the Polo Cup in Germany and Jetta TDI Cup in the U.S., in eight countries worldwide and is looking to continue expanding into new markets. The Cup programs give young drivers a chance to race VW-provided vehicles at relatively low investment costs. In the U.S., for example, racers pay $35,000 per season, with VW providing the track-prepped Jetta TDI sedans, maintenance and training. Drivers are responsible only for their helmets and travel expenses. The season’s winner gets $100,000, but that is hiked to $150,000 if he is signed to a professional contract within six months of the final race. Next year’s Jetta TDI Cup already has drawn interest from more than 1,000 potential drivers, and VW has yet to officially solicit applications. The eventual list will be culled to 100 who will be invited to a Sonoma, CA, track to select the circuit’s 30 drivers. These will be judged not only on their driving abilities but also for their media-friendly skills and how well they would handle other off-track duties. For now, VW is getting ready for the Dakar Rally, which Nissen says is the auto maker’s No.1 racing program. Slated for Jan. 3-18, the 5,600-mile (9,000-km) race starts and ends in Buenos Aires, Argentina, with about 90% of it run over sandy terrain and under the most extreme conditions. VW is entering the race with the Touareg 2, powered by a 5-cyl. turbodiesel generating 280 hp and 443 lb.-ft. (600 Nm) of torque. It features a 5-speed manual transmission and permanent 4-wheel drive. Two similar Touaregs competed in VW’s first foray in Baja in 2007, finishing a surprising 11th and 16th overall in the 500-mile (805-km) Baja 500. Weighing in at 3,942 lbs. (1,788 kg), the Dakar-bound Touareg 2 can hit 62 mph (100 km/h) from a standstill in 6.9 seconds and has a maximum speed of 118 mph (190 km/h). Participating gives VW the chance to prove its mettle in front of some 600 million people who watch the race worldwide, he says. BEIJING : October 30, 2008 - As part of the strategy to further expand its global business activities, Automobili Lamborghini S.p.A. will found a branch in China. Following a recent decision by the Board of Management, the Italian luxury sportscar manufacturer will establish Automobili Lamborghini China in the country´s capital city Beijing and will start operations at the beginning of 2009. Lamborghini´s rise to become one of the most successful and profitable super sportscar manufacturers is the result of a clear dual strategy. First, the creation of an incomparable new, broad and attractive product portfolio. Second and equally important, the ongoing expansion of brand representation to ensure substantial presence in all major markets of the world. In 2008 Automobili Lamborghini expects a growth of car sales in China by 186% ( 28 cars in 2007 toward 80 in 2008). The market for luxury products is characterized by stable and solid growth and by a wide presence in practically all major economic metropolis throughout the country. At the time being, Automobili Lamborghini has three dealers located in Shanghai, Guangzhou, Beijing, one in Hong Kong, and another two will be shortly be opened in Chengdu and Qingdao. More are to be established. Lamborghini is focused on establishing a roughly equal split of worldwide sales between the three major continental regions: Northern America, Europe and Asia. Stephan Winkelmann has appointed Eginardo Bertoli as Country Manager of Automobili Lamborghini China. Mr Bertoli will report directly to Enrico Maffeo, Director of Sales and Customer Service worldwide, who is based at the Lamborghini headquarters in Italy. Mr. Bertoli has a strong background in the automotive industry, having worked for a range of international companies such as Fiat Powertrain Technologies, Kongsberg Automotive and Interpump Group S.p.A.
Mr Bertoli’s career has included senior positions in Italy, the USA as well as China. During his three years’ assignment for Iveco Motors in Shanghai he gained substantial experience of the Chinese market. Zhang Xiaodong will be head of customer service China. He will manage all aftersales operations including warranty, parts and service, and will report to Eginardo Bertoli. TOKYO : October 30, 2008 - The head of Mazda said on Thursday he did not expect any change in the Japanese automaker's relationship with Ford Motor, amid reports that the struggling U.S. automaker would sell part of its controlling stake. "We've had a relationship with Ford since the 1970s," CEO Hisazaku Imaki told a news conference. "Our ties are so close that you can't tell how much of the company is Mazda and how much of it is Ford. We don't expect that there will be any change in this relationship." Shares in Mazda have been the worst performer of any Japanese automaker in the past month, punished for the company's vulnerability to a stronger yen since it ships most of its cars sold abroad from Japan. The share price has fallen more than 50 percent in the past month, compared with a 28 percent drop in Tokyo's transport sector subindex. WOLFSBURG : October 30, 2008 - Volkswagen presents its vision of the car of tomorrow with Internet access at the International Suppliers Fair (IZB), which is being held from 29 through 31 October at the Allerpark in Wolfsburg. The centre of attention will be a Tiguan prepared by Volkswagen Group Research and a WLAN network created by the research cooperative "Wireless Wolfsburg". The interaction of the pair provides the driver with selected information pertaining to life in the city directly in the display of the navigation system. In the research cooperative "Wireless Wolfsburg", Volkswagen, Wolfsburg AG, the AutoUni and WobCom together with a group of partner companies have set up a WLAN network for testing mobile Internet access. The Tiguan with the name "auto@web" is in constant contact with the Internet portal, which provides it with current, pertinent information. This all happens unnoticed by the driver. The city's events calendar and various search machines serve as additional sources of information. 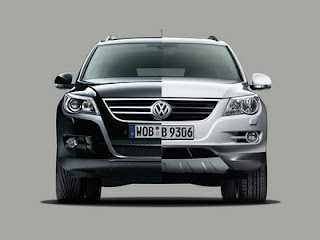 The spectrum of information is broad: from the cultural programme to interesting destinations in the city of Wolfsburg, the Tiguan receives a constant overview of the subjects "City Life", "Travel" and "Wellness". This selection of information appears neatly in the display of the navigation system. The auto@web and the "Wireless Wolfsburg" portal have still more innovative features: you can check, for example, whether the car's doors are locked or if the tank is full from your PC at home or your iPod. Furthermore, it is possible to load a map for your walking route from your parking space to your final destination on your mobile device or display the place where your car is currently parked. 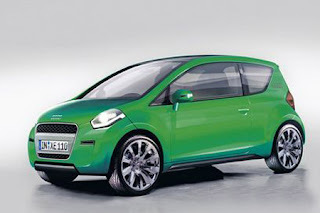 Volkswagen’s miniature Up! seems to be spawning little ones of its own. Audi is planning to unveil a new city car based on the Up! concept in 2012. The Audi will likely compete with top-end versions of the Ford Ka and Fiat 500. Audi is not the only one to borrow from this new micro-car platform. Lower market brands Skoda and SEAT are expected to get versions as well. TORRANCE, CA : October 29, 2008 - The restyled 2009 Honda Element entry-level SUV builds on its spacious and versatile character by adding a more chiseled exterior appearance and a refreshed interior design with an expanded selection of available high-tech and functional features. Manufacturer Suggested Retail Pricing (MSRP1) starts at $20,175 for the 2009 Element 2WD LX, plus a destination and handling charge of $670. The interior provides seating for four people along with a cargo area that quickly adapts to large items with its flip-up rear seats that fold flat, fold up and to the side, or can be removed titleogether (64-plus seating arrangements). The Element LX and EX have a water resistant urethane-coated utility floor that quickly wipes down and seat fabric that resists moisture; the Element SC has a carpeted passenger area. Air conditioning with micron air filtration is standard on all models. For 2009, exterior styling changes to the front of the vehicle provide a more substantial and bolder look. Changes to the front fascia and side profile involve a new hood line that follows a continuously horizontal plane extending from the A-pillar to the front of the vehicle. The new design replaces the downward slope that began mid-fender on the previous models and results in a more vertical front appearance. Steel front fenders replace the composite body panels on all models (the rear fenders retain composite construction). The new grille design provides a consistent appearance similar to other Honda truck models. The rear skylight, previously exclusive to Elements equipped with Retitleime 4WD, has been discontinued.